I feel as if I’ve been chasing Anna Greenland for a long time. Eight years ago, while putting together the garden team at River Cottage, I approached Anna to work with me. I tried to persuade her to swap the damp climate of her then-home in Cornwall for the damp climate of Devon; for some reason the attraction of Monterey Bay, California, proved stronger. Since then, our crossing paths have been a constant reminder that I missed out. She’s been on TV, on my work radar, working at gardens I photograph, growing in places I’d love to be gardening: for Raymond Blanc , Jamie Oliver and Tom Aikens; at Heligan, Le Manoir, Huntington Botanical Gardens in LA – and she had a big hand in creating the first vegetable garden at Kew. And what a “something” it is. 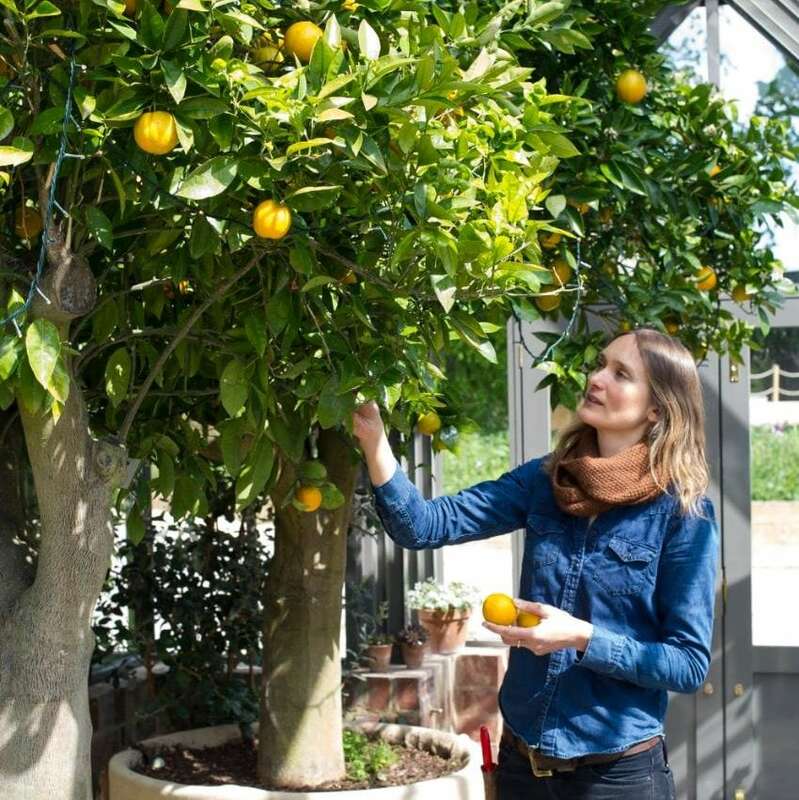 As well as 48 productive raised beds, there are polytunnels and glasshouses of everything from lemons to microleaves , with a beautiful garden dominated by herbs and trained fruit, the ideal setting for a cocktail and relaxation. Orchards, wild flower meadows, raised beds and productive containers: Anna’s influence stretches across the site. A six-month intensive course at the Centre for Agricultural Ecology and Sustainable Food Systems in Santa Cruz, overlooking Monterey Bay, immersing herself in forward-thinking approaches to growing, gave Anna a sense of belonging as well as a launch pad for more creative gardening. She says: “As a young person getting into growing, I didn’t feel there was a young, dynamic movement for me to hook up with – thankfully, that’s changing with ­organisations like the Landworkers’ Alliance. Now, growing and gardening has very much a feeling of being something fun to be part of. “I went on to Huntington Botanical Gardens in LA, to get involved in urban growing projects. Even there, in a very bright-minded horticultural environment, many people couldn’t understand why a woman would choose to do manual work. Maybe it’s because so many ­people have no choice. Our paths crossed again at this point, as I visited Raymond’s incredible ­Heritage Garden to photograph it for a book I was working on. “It was a really intense time as we were creating the Heritage Garden at Le Manoir, one at Kew for the Kew On A Plate book and series. It was madness: creative and full-on to be doing all that, as well as working to such exquisite standards for the kitchen. I loved it,” she says. For the last two years, Anna’s wings have been fully spread, running the garden operation at Soho Farmhouse. “It was fields and rivers of mud, all diggers and lorries, but the owners have given me an open brief.” Away from the productive raised beds, herbs, fruit and edible flowers dominate. She says: “As with Raymond at Le Manoir, I work closely with the chefs in putting together a plan for what we grow – a combination of the essentials the kitchen needs with plenty of niche crops I know would work on the menu that they might be unfamiliar with. “In a way, this whole undertaking is about creating a beautiful landscape of flowering herbs, punctuated by productive vegetables and fruit. It means that even the vegetable beds are full of beneficial insects and beauty. “I love embellishing familiar salad leaves with highly-flavoured leaves such as wood sorrel, oxalis, claytonia, summer purslane – bursts of flavour and visual pleasure to lift the plate. I’m always on the lookout for visual flourishes as well as flavour – purple carrots, different coloured beetroots, unusual radishes. It is hard to be more than the sum of your experiences, when they include Raymond Blanc, Jamie Oliver, Tom Aikens, Heligan and Huntington Botanical Garden, but Anna most certainly is.